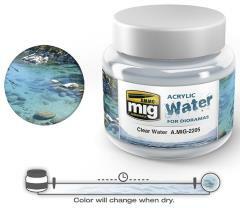 This product has been specifically formulated to realistically represent any kind of water, such as oceans, rivers, lakes, waterfalls and even icy surfaces. This reference has the characteristic color of abundant and fast-flowing river waters! The translucent finish is perfect to achieve a depth effect as well as a realistic water color. The product is thick enough to be poured onto all kinds of surfaces, even slopes. The slow drying time makes it possible to model moving waters, like waterfalls, rough seas, waves, etc. with no pressure. It can be mixed with other products of the same range or small amounts of acrylic paint to slightly alter the color without turning opaque. It can be diluted either with water or acrylic thinner to change the consistency. Begin by painting the water feature in your color of choice. Once dry, apply the gel with a palette knife or another similar tool. You can model the surface while it dries using old brushes, sculpting tools, toothpicks, etc. The product is odorless, and dries in 24 hours. Tools can be easily cleaned with water. This range of products has been specially formulated for modeling, so it doesn´t have unnatural colors like some Arts & Crafts products on the market. Once dry, the results are colors matching those found in nature to add an authentic and realistic touch to your dioramas.